Mechanical insulation for industrial and commercial new construction projects is often one of the last considerations made by building owners and/or GCs. Because of that, many issues can come up during the installation process, usually when general or design/build contractors have the best intentions of saving money on initial construction costs. When that is the case, they will often ask insulation contractors to value engineer the insulation in order to help reduce project costs. All of the methods above result in a significant reduction in performance. Insulation systems are specified and designed to achieve particular results, and installing anything less than the specifications is doing a disservice to the entire system. The building owner or occupants will not get the maximum energy savings they would have gotten if the system had been installed as specified. Value engineering also plays into communication between the insulation contractor and the general or design/build contractor. When sacrifices need to be made in the design of mechanical systems, it can also affect the insulation. For example, in the photo above, the pipes were installed too close together, meaning that the opening is too small to allow for the proper insulation thickness. This will have an impact on the facility’s overall performance. The true best way to save money when it comes to mechanical insulation is to install a system that reduces energy consumption and emissions as much as possible, with whatever insulation thickness and materials are required. 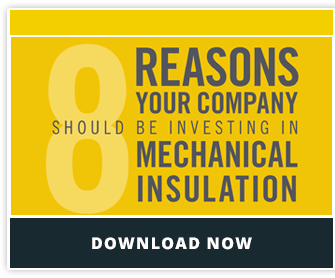 This is the fastest way for building owners to see ROI on their insulation investment, since mechanical insulation starts lowering a facility’s operating costs as soon as the system energizes. While it is possible to “value engineer” a mechanical insulation system, as an insulation contractor it is my job to ensure that I’m providing the highest standards of energy savings, safety and performance. I can get creative to reduce the costs of a project when necessary if that is the main objective. With years of experience, I’ve developed strategies for meeting any requirements needed. However, when considering ROI and energy savings, cutting performance is not a value in the end.